We sometimes think we’re asking too much of God when we run to Him, but He wants nothing more. I’m in total agreement! 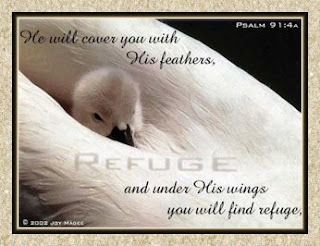 Praise God for HIS mighty wings of protection. I’m so thankful for God’s wings of protection. Sometimes when I’m really scared about something, I picture myself with my head on his lap, laying by his side like I used to do with my mother. She would stroke my hair and reassure me. I love thinking of God reasurring me in this sweet way. What a beautiful image of God’s protection. Thanks. Lynn – that’s just beautiful. What a place of safety and security and joy it is. Thank you for writing it so clearly. When we know that place, we never want to be anywhere else. Lynn that was beautiful. Thank you. Lynn, I awarded you the Lovely Blog Award on my blog today. To learn more visit http://marketingchristianbooks.wordpress.com. Amen, Diane! If we remember how much we love for our child or grandchild to climb up in our lap just to be near us, we should remember that God loves it even more! Be blessed, sweet one! Kimberly, You are such a faithful reader. You always make my heart so happy! Bless you! Oh, Sharon! That is so precious. I hadn’t thought of that. You are so right. My mom did the same thing. Thank you for triggering that memory! Bless you! Thank you so much, Sheila! I so appreciate your faithfulness to follow my blog. Bless you! Laura, Thank you so much for taking time to read and comment. You touch my heart. Blessings to you! Oh, my, Sarah! I am overwhelmed. You are such a sweetheart to honor me with that award. Thank you so much! Bless you! Great post Lynn! I think it’s important for me to remember that the action in this Psalm needs to be taken by me. I need to run to Him, I need to dwell in Him, I need to seek His refuge. I need to be constantly moving toward a relationship with Him. Thanks for his reminder. What a beautiful image your post brings to mind! We all need a secret place to retreat at times, and those no place better to turn than to God. Thank you, Lynn. Your post lifted me up with the gentle reminder that God loves us. I just got to read this..You sent me the link on Facebook. Thank you!! When I feel like I just need to hide..I find refuge in His Word. It is what truly brings me hope and brings me out of dispair. Thanks for this posting..I love the mother bird making the sacrifice..